A sinister cloud of enchantment hangs over Droz's castle, where everything from dust motes to kitchen utensils is alive and possessed of dubious intent. As in dreams, extraordinary things happen regularly and are treated as business as usual by the people experiencing them. The character of Droz incorporates aspects of Dracula and Frankenstein, and like many great villains, he drags a pair of innocent lovers into his web. As was the case with the Quays' first live-action film, Institute Benjamenta (1995), the protagonist is played by Gottfried John, a German actor best known for his work with Rainer Werner Fassbinder. John has one of those unforgettable Fassbinder faces, etched with all the sorrows of centuries of humankind, and he has a perverse flair for comedy that's delicious to watch. The Quays have been hailed as masters of animation, but they handle actors with aplomb too. Dialogue plays a minimal role in their work, leaving the actors to communicate primarily through body language and facial expressions. The Quays choreograph their cast with precision, keeping the performances intense but just this side of the mannered excess that mars many silent films. Big thanks to David McCoy for the Zeitgeist Screen Caps! Addition: The first thing to note about the 2006 release from Artificial Eye is that its color palette is both slightly lighter than the Zeitgeist disc and tends to have a more grayish hue while the Zeitgeist tends toward more sepia tones. The end result is that while the Artificial Eye release has greater detail (see the face in fifth captions), the skin tones look more natural to me in the Zeitgeist. However, since the production is so highly stylized, I cannot say with any degree of confidence which color scheme is closer to the directors' original intent. As far as audio, I can only assume (since I don't have the Zeitgeist disc, I can only go on what the previous reviewer wrote) that the Artificial Eye is the clear winner. The 5.1 Dolby Digital is borderline flawless and picks up on details that the 2.0 Dolby track missed out on. 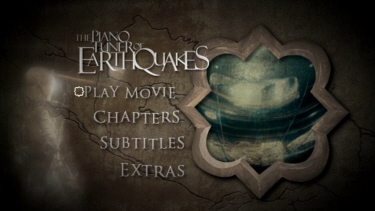 The disc also contains optional English subtitles (not pictured) that are unobtrusive and easy to read. Finally, the extras also present some differences. While I strongly suspect that the 'making of...' documentary is the same on both discs, the Artificial Eye release lacks the Zeitgeist's Lorcarno press conference. Although I haven't seen this particular extra, it sounds fascinating and I'm sorry that I've missed it. The remaining extras on the Artificial Eye are all pretty standard fare (including the short deleted scene) and add little to the experience. So which release should you consider? If you're a fan of the film, then I doubt that you'd go wrong with either. However, if forced to choose, I'd go with the Artificial Eye for it's noticeable increase in sharpness. 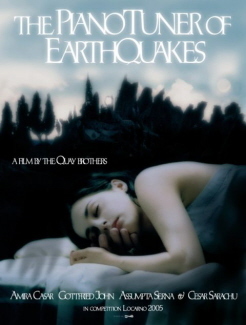 Though minimalist in style, the Dolby Digital 2.0 stereo English track does a more-than-adequate job of reproducing the movie’s eerie, claustrophobic sound design. The dynamic range isn’t very wide, though given the nature of the movie, you don’t really need high highs or low lows. Some of the actors’ heavily-accented English may require you to strain your ears, though this is as much a general communication issue as it is a technical one. 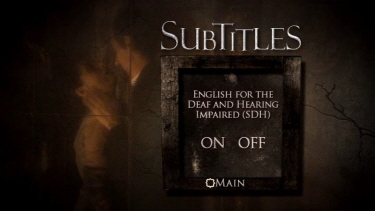 Optional English subtitles support the audio. 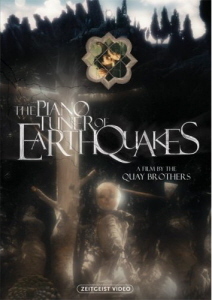 “The Making of The Piano Tuner of Earthquakes” is a 50-minute interview with the Quay Brothers and co-writer Alan Passes interspersed with behind-the-scenes footage. 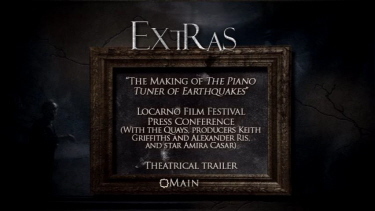 “Locarno Film Festival Press Conference” is a videorecording of the Quays and some cast members promoting the movie. As expected given their output, the Quays’ comments are sometimes rather abstract in nature, though how they answer questions reveals as much about their processes as their actual answers do. 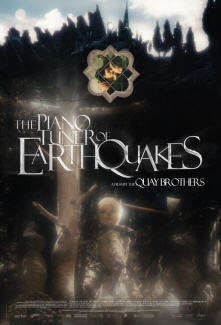 You also get the movie’s U.S. theatrical trailer. 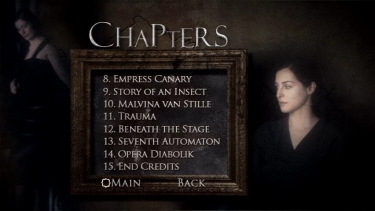 A foldout insert provides chapter listings, excerpts from an interview with the Quays, and movie and DVD credits. Once again, Zeitgeist is using transparent keepcases for one of its DVD titles.